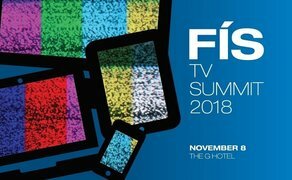 The second annual Fís TV Summit will take place in Galway on November 8th. Major TV industry executives, creators and producers will take part in talks, panel discussions and networking events. Guests include representatives from RTE, TG4, BBC NI, ITV, Screen Ireland, S4C and many more. The first panel ‘Let Me Entertain You’ - a discussion on the latest trends in TV entertainment with the broadcasters will feature special guests Eddie Doyle, Head of Content Production, BBC Northern Ireland, Elen Rhys, Content Commissioner, S4C, Margaret Cameron, Channel Editor, BBC Alba, John McHugh, Head of Entertaimnent, RTE, Máire Ní Chonláin, Head of Entertainment, TG4. Panel sessions feature a host of broadcasting leaders and innovators discussing topics including ‘Let Me Entertain You - a discussion on the latest trends in TV entertainment with the broadcaster’, ‘Funding Across the Regions - a guide to regional funding around in Ireland & Europe’, ‘Get To The Point - looking at short form online digital content’, ‘Bread and Butter - a look at returnable series and brand formats for sustainability’ plus a case study on a highly successful long running entertainment programmes. This event is hosted by Galway Film Centre. For more information and to book tickets to the event.